How Ideologies Impact Problem Solving? Ideologies don’t get discussed openly. But they are the ‘invisible hand’, determining our perception and responses. So if the ideologies converge, you will make quick progress. When teams assemble together to solve a problem, last thing on their mind is differences in ideologies of their members. But ideologies greatly impact problem solving. In fact, its impact starts well before solving the problem at hand; it affects the way the problem is perceived. But before we discuss how ideologies impact problem solving, let us define ideology. The reputed TED speaker Ken Robinson in his book, Out of our minds, defines ideology as “assumptions, values and beliefs that constitute our taken-for-granted views of reality, our natural conception of the way things are.” He goes on to say that these ideologies determine how we theorize the world around us. All of the above are valid ideologies; not necessarily helpful ones in all situations. The important point is to be aware of ideologies of our own and others and the interplay of them in solving the problem at hand. So how do these ideologies steer us in solving problems? Ideologies influence our perception of the problem: While Al Gore is educating the world about the Inconvenient Truth and winning Oscar for it, there are those who question the accuracy of that truth. When ideologies don’t converge, what appears as a problem for one group may not be so for another. What solution can emerge if there is no consensus that there is a problem in the first place? Ideologies define boundaries for idea generation: I am a member of a group recently constituted to solve a technical issue in integrating nation’s e-Governance programs. One set of members, argued that the individual programs should be developed around the defined e-Governance standards while another took a position that their program is bigger than anything attempted so far, so the standards should be modified to suit the evolving needs. While all of us agreed that there was a problem, conflicting ideologies within the group constrained the options to solve the same. Ideologies guide evaluating risks of a selected solution: Traders and investors (especially value investors) estimate risk of their investments from diametrically opposing ideologies. Hence a quarterly dip in profit of a sound company may cause panic to a trader; while a value investor may continue enjoying his holidays without a slight concern about the results. Ideologies determine our responses to hurdles: No organizational problem gets solved without hurdles. Unconsciously our responses are determined by our belief system. When faced with corrupt government bureaucracy, a lady who believes “Honesty is the best policy” will respond differently than a man who thinks, “Millions can’t be made with honesty”. Without getting judgmental about these responses, suffice to say that if these two are in a group, then there will be irresolvable conflicts in solving problems. 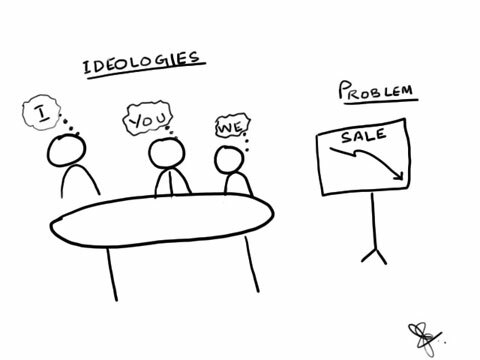 Ideologies don’t get discussed openly in organizations. But they are the ‘invisible hand’, so to speak, determining our perception and responses. So when you are in a group to solve a problem, check if the ideologies converge. If they do, you will make quick progress.